Dark brown restaurants are unappetising in the same way that dark brown stews are unappetising. There might be good stuff in there. It might be nutritious and tasty. But you’ve got to tread carefully through the murk to find any lurking goodies. Goodman is a new steakhouse situated in a dark, narrow street in Mayfair. It has a dark, narrow interior to match and it serves dark narrow bits of meat. A proper steakhouse will always be clubby and masculine, but have Goodman, like Boy George, suddenly gone too far down the butch route? Over lunch, I notice quite a few women looking at the menu posted outside Goodman’s front door, peering inside, then walking away. From street level, from a certain perspective, Goodman is not very inviting. So the women vanish into the November murk, taking their custom and their orders for goat’s cheese and their important thoughts about Angelina’s latest tattoo elsewhere. Perhaps it is all for the best. 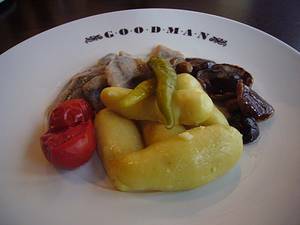 Goodman is a Russian steakhouse chain, with nine branches in Moscow alone. You can see from the outset that they take their steakski very seriously. If you want to work at Goodman, you have to become a ‘meat professional’ because ‘meat does not tolerate amateurs’. Crikey. If you want to be a customer, you are encouraged to ‘be a Goodman’, the kind of person who only wants the best, meat-wise. Famous customers to have succumbed to this diktat and signed their visitors’ book include Dolph Lundgren (Thanks for the Number 1 Steak!). Now I understand. You’ve got to be a meat professional at Goodman so you can tell the difference between Dolph and a slab of prime fillet. In the brown depths of the new London branch of Goodman, the waiters are dressed like chefs. Confusing. However, the boys zip around so efficiently in their chef’s whites and aprons that diners can be comforted by the fact that they will not be hanging around for long. Unlike the steaks. The good news is that in the fashion of a classic New York-style steakhouse, prime cuts of beef will be hung in the on-site drying room to mature before being seared over the grill. 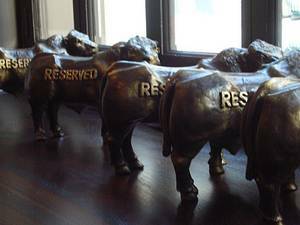 The bad news is that all the steaks on the menu are imported from grain-fed American and Australian cattle. Why won’t they sell our lovely grass-fed British beef? Goodman say they will. They say they’ve got some in the drying room that just hasn’t aged yet. In the meantime, the menus boast three cuts of 110-day hung Australian beef (rib eye, New York strip, filet mignon) and two types of 120-day hung USDA (rib eye or strip). Hmm. Non beefy main courses include a day boat fish of the day, pork loin or roast chicken. Starters include beefy ones such as carpaccios and tartares alongside cured meats and a roast aubergine dish. There is a £12 Goodman beef burger with chips, a good example of the very reasonable pricing throughout. The steaks themselves are banded by weight, not price. A 400g rib eye, a 350g sirloin and a 250g fillet all cost £25, extras not included. However, the weight banding is a particularly excellent system when you really fancy a fillet, but don’t want to look greedy or as if you’re taking advantage of your date. To begin, we have salted Russian herring with boiled potatoes and mushrooms. Add a nip of iced vodka, and you have a brisk and authentic experience. This is certainly the time of year for lovely fat herrings. The Goodman ones are rich and flavourful, although the reconstituted, dried mushrooms are a waste of everyone’s time. A main course of US New York strip steak came medium rare, as asked. Hardly surprising, as there is only one other diner in Goodman today, but well done all the same. The steak is a big thick bruiser, juicy and nicely charred. Perhaps an even bigger scorch would not go amiss, but the long hanging and the flavour make this a good steak. The chips are £4 but worth it; hand cut, showered with rock salt, crispy and hot. Fine green beans are good and crunchy, served with little shreds of friend onion; a terrific touch. From a quartet of sauces – steak sauce, Béarnaise, mushroom or pepper – we have the latter. It is okay, but really good pepper sauces have to be made at the table; a proper sorcerer’s swirl of cream and brandy and freshly cracked peppercorns. Which this is not. S manages to cram in a pudding; an iced peanut parfait with raspberry salad – perhaps the fruit was flown in from Australia on the same plane as the beef? However, it is very good, with a pool of crushed raspberries and a crunchy biscuit base. The wine list is compiled in a haphazard manner, but there are certainly enough options here to match your beef. A glass of Gers (from the south west of France, come on you ’Gers!) was deep and chewy. Overall, I think Goodman will flourish. I think that lots of people will like it. In some respects, it’s rather like a comfortably appointed, grown up burger bar, but there is nothing wrong with that. Most importantly, there are scant few places in the West End where you can get a really decent steak, well sourced and cooked by a technically proficient kitchen. And Goodman is excellently situated for Christmas West End shopping (within a tantrum throw of Hamleys) and the family-friendly pricing is a lure. It is not brilliant or alluring, but it is good. I can’t leave without mentioning the three course £15 set lunch. Starters include beef carpaccio, Jerusalem artichoke soup or Caesar salad, followed by grilled ribeye steak sandwich with salad or chips, haddock and chips; or a Goodman burger with your choice of topping, plus good puds. You won’t get browned off here. 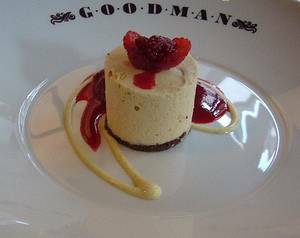 Goodman, 26 Maddox Street, London, W1S 1QH. Tel: 020 7499 3776. A la carte steak lunch or dinner for two, excluding drinks and service, £80.